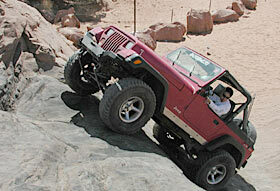 The fuel-injected stroker motor allows our YJ to run at extreme angles and produce torque at lower RPM's. Everyone I talked to immediately brought up a V8 swap but this was not feasible cost-wise for a starving college student like me. I also believe that Jeep quit putting V8’s in the CJ series for a reason. With these thoughts in mind, I decided that just a basic rebuild with a slight twist would do the trick. The slight twist that I am referring to is stroking the stock 4.0L to a 4.5L. The term stroking the motor refers to altering the distance that the piston travels in the cylinder bore and therefore increasing or decreasing the total displacement of the motor. Obviously, in this case I am increasing the displacement by .5L. If you subscribe to the theory “there is no replacement for displacement,” this is exactly what you are looking for. The 258 (258 cubic inches - 4.23L) was the predecessor to the 4.0L (242 cubic inches) that we see in many of today’s Jeeps. It is known for its excellent low-end torque, which is ideal for wheeling. However, its less than desirable carburetor, vacuum system, and highway drivability make it less than ideal for a daily driver. This led Jeep to design the 4.0L. The 4.0L is basically a hot rod 258, despite its smaller displacement. Jeep took the 258 platform and improved it with fuel injection, better head design, a header, a different cam, larger cylinder bore, and shortened stroke. The fuel injection was a godsend for this motor. It improved the fuel economy, allows the Jeep to run at any angle, and allows the driver to walk out to his rig when it is 5 degrees outside and the Jeep starts right up. The rest of the modifications improved the motor’s on-road drivability, as well. These improvements were not all good for the 4-wheeler, though. If the torque produced by these two motors is compared, you can see that while the YJ's 4.0L produces more (220ft-lbs vs. 210ft-lbs), it happens at a much higher RPM (2,500 vs. 1,800). This is not as desirable for off road where the revs typically don’t get up to 2,500. If one could combine the desirable traits of both of these motors, it could be an ideal power plant for the daily-driver/weekend warrior rig. This is the inspiration for stroking the 4.0L. The goal here is to retain all of the on-road drivability benefits of the 4.0L while gaining the low-end torque of the 258. I imagine that some of you are still wondering why not go with a V8. After all, those stroker kits are pretty expensive. A lot of us have heard the urban legend that this stroker can be built with the right combination of factory parts. The problem is, very few people know what that combination is and even fewer people know where to find those people. It was my goal to figure out this combination and therefore be able to build my own stroker kit. The basis for any stroker motor is the crankshaft. Most who have heard the legend of this motor hear that the 258 crankshaft is what is needed to gain the extra displacement in the 4.0L block. The question then becomes, what needs to be done to fit the 258 crankshaft in the newer block? The answer is essentially nothing. A comparison of the mechanical specifications of the two different crankshafts reveals many similarities. In fact, all critical specifications for the crankshafts are identical except for the stroke, which increases by .455” with the 258 crankshaft. So the numbers indicate that the crank will fit, but does it really? The answer here is yes. The crankshaft that I used was out of a 1983 CJ-7. The only problem that I found with it was the front end where the harmonic balancer fit was approximately ¼” longer. This problem was easily remedied with a spacer between the balancer and the fixing bolt. It also could have easily been machined down to the proper length. So obstacle #1, crankshaft compatibility, has been conquered. The next obstacle that I faced was what connecting rods to use. The stock 4.0L rods in conjunction with the increased stroke would cause the piston to contact the valves so that was not feasible. A comparison of the 4.0L connecting rods to those found in the 258 again reveals many similarities. In fact, all of the specifications are identical with the exception of weight and length. The weight is not of great concern so we will ignore this detail. The length of the 258 rod is exactly ¼” shorter. The stroke increase of .455” is divided between the top and the bottom of the pistons travel. This means that it would actually only move up .2275” more than stock (.455” divided by 2). The shorter rod will offset this extra piston travel up so, in this case, the piston will actually end up .0225” lower in the cylinder (.2275”-.250”). All this adds up to one conclusion - on paper, the 258 connecting rods will work. And again, they do work when put into action in the real world.